West Ham United head into their match-up with Everton at Goodison Park on Sunday low on confidence and needing a win in the worst way. The Hammers have lost all four of their Premier League games so far this season, and manager Manuel Pellegrini seems devoid of answers. The club have been poor going forward and at the back, but they can solve one of those problems by reinstating Javier Hernandez in the starting line-up against the Toffees. Chicharito, on a reported £140,000-per-week at the London Stadium [Source: Spotrac], was slightly underwhelming for the club last season, and they need him back to their best if they’re to climb out of their current hole. Marko Arnautovic has primarily operated as the lone striker for Pellegrini so far this term, and while the 72-cap Austrian has played well, he is best employed alongside another frontman up top. Hernandez is the man Pellegrini should pair with Arnautovic on Sunday. The former Stoke City man does a lot of good work in build-up play, and that’s something that the Mexican can benefit from. Arnautovic, while an adept goalscorer, is a creative player at heart, while Chicharito is a born poacher. With Arnautovic playing off him Hernandez can focus on staying in the box and sniffing around for chances. Besides, the 30-year-old wasn’t as bad as some people thought last campaign. Yes, he only scored eight goals, but those strikes averaged at just over one every two games [Source: Transfermarkt]. That’s a good record for a player operating in a poor team. 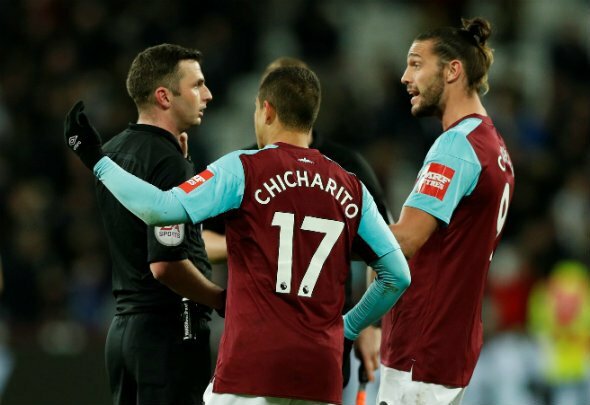 The Hammers need to score goals if they are to escape their current plight, and no on in their squad is more adept at finding the back of the net than Chicharito. Pellegrini needs to be brave and go for two up front, with Arnautovic playing slightly off Hernandez. There would still be a place in the team for two central midfielders, plus Felipe Anderson and Andriy Yarmolenko. West Ham need to take risks now, there’s no point not doing so, and that’s means throwing all their best offensive players on the pitch. Goals win matches and Hernandez is the man to provide them for the East London outfit. With Arnautovic by his side, Chicharito can fire the Hammers out of trouble and ease their current worries.